William & Mary students interested in entrepreneurship have a new opportunity to connect and collaborate with local entrepreneurs. StartupLINK — a partnership among the Alan B. Miller Entrepreneurship Center at the Raymond A. Mason School of Business, Launchpad Incubator, Thomas Nelson Community College and James City County — introduces members of the local entrepreneurial community to enterprising William & Mary students and other locals. The organization holds monthly entrepreneurial networking events where participants are invited to collaborate with regional entrepreneurs, share startup ideas and access business tools and resources. The monthly sessions are open to any interested resident, which often includes local business owners and founders of startup companies, as well as William & Mary students. The program launched with an event at Miller Hall in August, featuring Robby Willey ’05 and Chris Smith ’07, co-founders of the Virginia Beer Company. In September, Tiffany Jana, co-founder of TMI Consulting Inc., shared her insights with the group. Signed copies of her book, “Overcoming Bias: Building Authentic Relationships across Differences,” were given to participants as part of the event. William & Mary finance student Matthew Buckley ’18 was thankful for the opportunity. Graham Henshaw, the executive director of the Mason School’s Entrepreneurship Center, says the StartupLINK name is significant. BEERTREPRENEURS: Robby Willey ’05 (right) and Chris Smith ’07, co-founders of the Virginia Beer Company, were the featured guests at the kickoff event in August. Henshaw is also a clinical associate professor at William & Mary, and has been teaching in the areas of entrepreneurship and innovation and design since 2012. In 2016, he collaborated with Tim Ryan, the director of Launchpad — a business incubator that serves Williamsburg-area entrepreneurships by providing necessary resources such as office space, mentorships, workshops and access to capital. Together, they hosted a variety of entrepreneurship events through the Mason School’s Entrepreneurial Connection, but soon realized there was room to grow. Founded in late 2016 on the third floor of Miller Hall with the support of Alan Miller ’58, D.P.S. ’14, the Entrepreneurship Center provides a space for students to pursue their entrepreneurial goals. The center houses workspaces for students and two faculty offices for Executive Director Graham Henshaw and Managing Director Ronald Monark. Miller, founder of Universal Health Services, was named Entrepreneur of the Year in 1991 by Ernst & Young LLP. 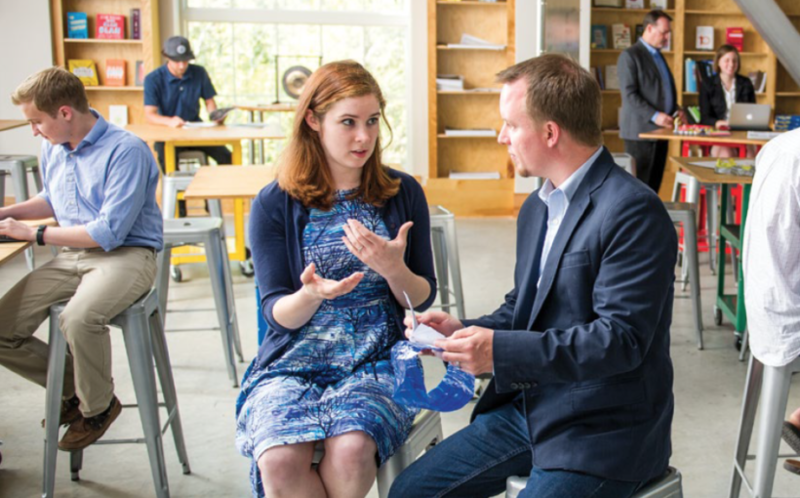 Through programs designed to stimulate entrepreneurial thought, the center emphasizes their principles of “Design Thinking” and “Customer Development,” which encourage creativity and adaptability. By sharing resources with Sherri Thrift from TNCC and Kate Sipes, the economic development assistant director of James City County, they were able to form StartupLINK and reach a much larger audience. Henshaw and Ryan both see great potential in StartupLINK’s ability to provide valuable resources to students and the local community.